The top rim of a 55-gallon (210 liter) steel drum is 18.5" (47 cm) from the floor when in horizontal position on the model 40. Model 31 Tipping Lever is sold separately. Tipping Lever to facilitate one-man loading drum onto model 40 or model 40-30 Drum Cradles. 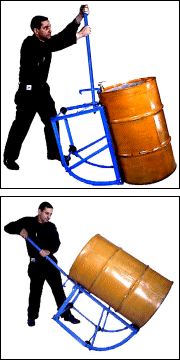 Assists in pulling over a heavy drum from upright onto the drum cradle. Constructed with 40" (101.6 cm) steel tubing with malleable iron double hook to engage the upper rim of drum. 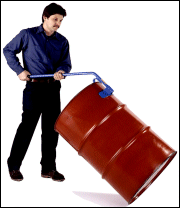 Rock-over style drum cradle trucks are intended for use with a drum up to 500 Lb. They include a retractable tipping lever, an all-welded frame, and 4 MORTUF polyolefin 3" wheels. This 55-gallon barrel tipper is shipped complete. In pouring position to dispense drum, the top rim of a 55-gallon (210 liter) steel drum is 15.5" (39.4 cm) from the floor. 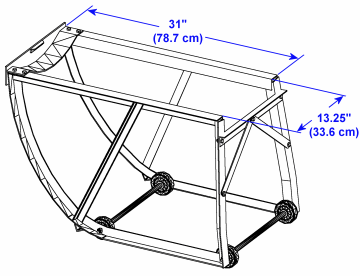 This steel framed drum cradle truck is specifically designed to handle a 15-gallon (57 liter) drum. Ergonomic 2-stage rock-over loading eliminates drum lifting. In pouring position, the drum rim will be 13.75" (35 cm) above floor for dispensing into your 5-gallon pail. 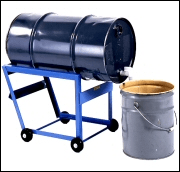 Model 46 15-Gallon Drum Cradle has 4 MORTUF chemically resistant polyolefin wheels mounted outside the frame, for added stability. The Morse Drum Upender / drum tipper provides leverage to raise a horizontal drum to vertical position. IMPORTANT: The Drum Upender is NOT designed to safely lower an upright drum, to horizontal position. 55 Gallon Drum Cradles to move, position dispense drum. Drum cradle trucks, tilting drain stands.